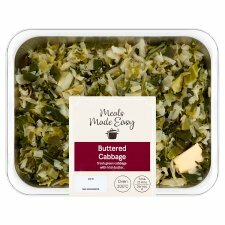 INGREDIENTS: Green Cabbage (96%), Salted Butter (Butter (Milk), Salt) (3%). Remove Label. Oven cook only. Pierce film lid several times. Place on a baking tray in the centre of a pre-heated oven for 20-25 minutes. Carefully remove film lid. Allow to stand for 1 minute before serving. Not suitable for oven cooking from frozen. Defrost thoroughly for a minimum of 12 hours in a refrigerator. Once defrosted use on the same day.